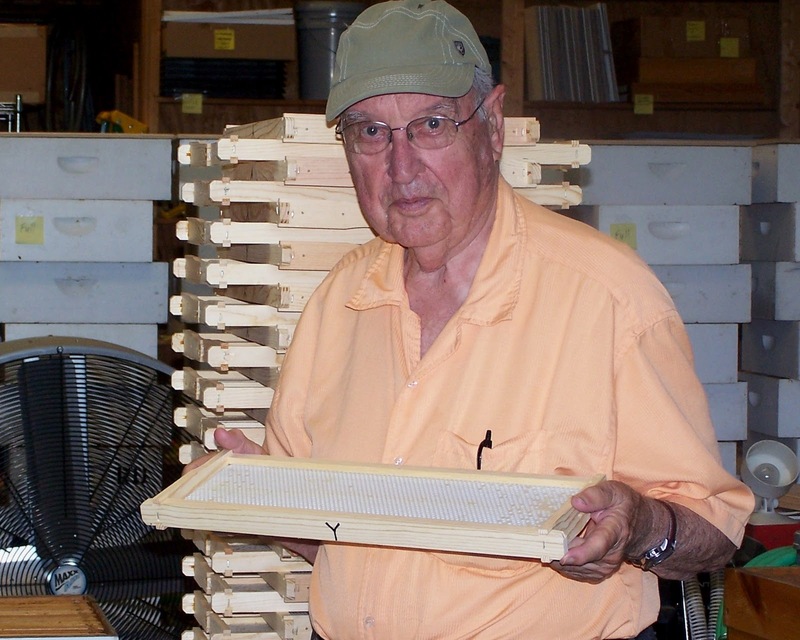 Peace Bee Farm Master Beekeeper Richard Underhill of Conway, Arkansas muses on life with the bees and other things. Beeswax is an important product of the bee hive. This high-quality wax, secreted by young worker bees is the structure of the honey bees’ nest. Beeswax can be collected from old honeycomb or from the capping wax removed when extracting honey. The cappings are the beeswax seals the worker bees place over the cells holding fully ripened honey. Removing old comb is an effective way to remove absorbed environmental chemicals from the hives and reduce diseases spread by spores: American foulbrood, chalkbrood, and Nosema. At Peace Bee Farm, we consider replacement of old honeycomb an important part of our integrated pest management program. Since we don’t use chemicals in the hives, the capping wax that we save can be used to produce new frames of chemical-free honeycomb. Nanda Uganda asked about processing beeswax. 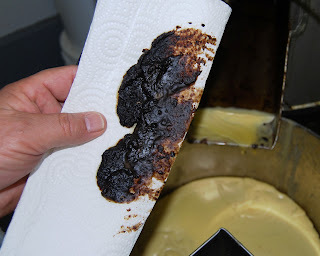 To obtain the beeswax we paint onto plastic foundation, we take our capping wax and heat it in a wax melter. The capping wax, which contains a small amount of honey, melts around 145 degrees Fahrenheit. This honey can be recovered when the wax melts, but honey is altered in color, aroma, and flavor by temperatures above 120 degrees. 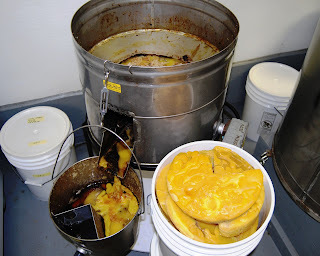 The melted beeswax and heated honey flow from the wax melter into a separator, a simple container with a baffle. The beeswax floats atop the honey. When the beeswax cools and solidifies, thick residue, called slumgum, can be scraped away. To further purify the beeswax, it is melted several times in water. The water absorbs soluble impurities in the beeswax; insoluble material is strained from the beeswax. Repeating the process refines the beeswax. We use beeswax primarily to coat frames for the brood nest and honey supers of our bee hives. Other uses include candle making as well as a number of bee hive products: hand and skin creams and lotions, lip gloss, soaps, furniture polish, and leather conditioners. People who sew use beeswax to strengthen their thread, and archers coat their bowstrings with beeswax. The honey house is a small, insulated building where we handle the honey from the time that it is harvested until it is bottled. There are tasks to be done in the honey house throughout the year, but the comfortably warm building is an exceptionally nice place to be when outside temperatures are below freezing. Honey bees produce honey in the spring, summer, and fall when flowers are in bloom. They store honey in their hives for the winter. We harvest a small portion of their surplus honey and store it in the honey house. All honey changes over time from a liquid to crystals of sugar. The formation of crystals doesn’t harm the taste or quality of honey. Some of the sugars in honey are stable as a crystal and not as a liquid. Different honeys convert to crystals faster than others. Generally, honeys that bees make from flowers crystallize faster than honeys derived from flowering trees. Cool temperatures also speed the formation of crystals. By winter, most honey contains crystals. We slowly warm the honey to re-liquefy it. Stirring daily, most honey can be liquefied in three to five days at 108 degrees Fahrenheit. The honey is then held at 100 degrees until needed. The warm honey pours freely from the bottling unit. Some liquid honey is made into creamed honey. This spreadable honey is formed by mixing in fine crystals of honey and then chilling at 57 degrees. Beeswax is also being melted and cleaned in the honey house. In its first melting, some honey is removed from the beeswax. Since beeswax melts around 145 degrees, this honey has been heated, altering its color and flavor. We never mix this heated honey with our raw honey; it is sold to those who produce mead, or honey wine. The final residue left from melting and straining beeswax, called “slumgum,” is shown in the photo. It is composed primarily of propolis bee glue, pollen, and silk from bee pupae cocoons. My friend at the Memphis Botanic Garden, horticulturist Sherri McCalla, sent me a quote from Fred C. Galle’s Hollies: The Genus Ilex: “Of all old English traditions, however, one of the most enchanting is that even the bees must be wished a Merry Christmas; a sprig of shiny green and bright red holly must adorn each hive.” This is a fitting tradition, as the hollies are an important family of bee plants. Hollies provide ample nectar and pollen for the bees. The bees pollinate holly flowers, producing fruit and seed in bright red berries. Clothianidin is an insecticide belonging to a relatively new class of pesticides known as neonicotinoids. These nicotine-based chemicals are systemic in action, meaning that they are taken up through a plant to poison all of its parts. They are of great concern to beekeepers around the world because they poison the nectar and pollen consumed by honey bees and other pollinators. Clothianidin is often coated onto the seed of crops. It is in widespread use in the United States as an insecticide on corn, the nation’s largest crop. Other crops treated with clothianidin include canola, soybeans, sugar beets, sunflowers, and wheat. While corn, a grass, provides no nectar, it does produce a large amount of pollen, which is very attractive to honey bees. The use of clothianidin has steadily increased since its conditional registration in 2003. Beekeepers have experienced heavy winter die-offs from that time to the present. The EPA quietly presented Bayer with full registration of clothianidin in April of this year following a seriously flawed trial funded by Bayer. The trial, conducted in Canada, placed hives near canola plots treated with clothianidin and untreated control plots. Remarkably, both plots were located so close together that the honey bees had free access to both. EPA scientists questioned the validity of the trial. Others experts analyzing the trial found significant flaws in its design: corn produces much more pollen than does canola; corn pollen is more attractive to honey bees; and canola is a minor crop in the US, while corn is the most widely planted crop. The neonicotinoids, including imidacloprid, are suspected by beekeepers and many scientists as contributing to honey bee colony collapse disorder. Clothianidin is a persistent pesticide, meaning that it remains in the environment for a long time, and the pesticide is highly toxic to honey bees. You may read the report at http://www.grist.org/article/food-2010-12-10-leaked-documents-show-epa-allowed-bee-toxic-pesticide-. Without independent investigation, the neonicotinoids remain suspects in colony collapse disorder. Clothianidin is banned in Germany, France, Italy, and Slovenia. Today’s photo: clothianidin-treated corn. Honey bees and humans keep different calendars. Today is the winter solstice, the Northern Hemisphere’s shortest day. For us, it signifies the first day of winter and the beginning of the coldest part of the year. However, for the honey bee, today seems to be the start of the new year. With the days lengthening after today, queen bees may restart laying eggs at any time. 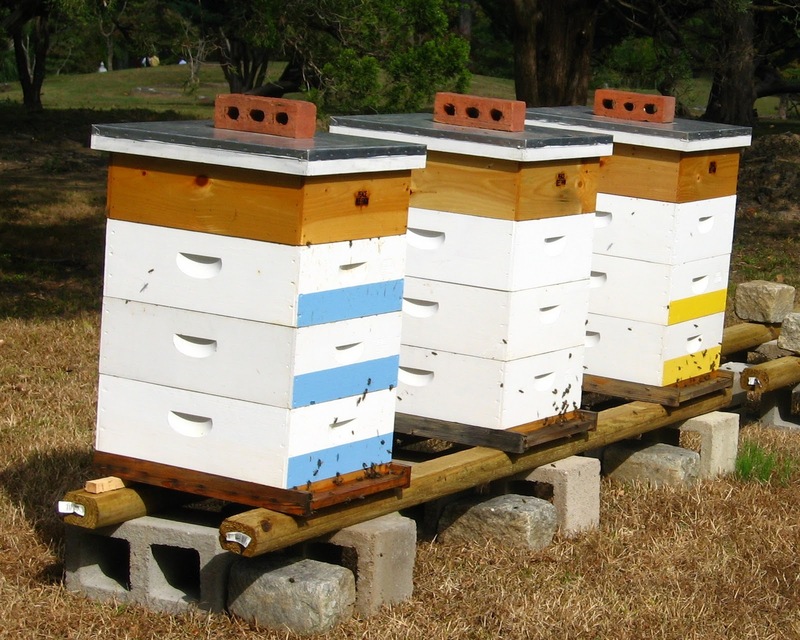 Many colonies begin brood production on a small scale during the month of January. Most of our hives here in the Arkansas Delta stopped brood production in late October and early November. As a survival measure, the bees conserve food stores during cold weather by maintaining a cooler hive when there is no brood present. Just as we turn down our home thermostats in the winter to conserve energy, the bees regulate their winter cluster at around 70 degrees Fahrenheit. Whenever there is brood present, the bees warm the cluster surrounding the brood to 95 degrees. To warm the cluster of bees to the higher temperature requires the bees to consume a considerable amount more honey. The honey bee evolved an efficient behavior for maintaining warmth in the hive. Workers only warm the cluster of bees, not the empty spaces around the cluster. The hairy bodies of the bees and the design of the beeswax honeycomb make effective insulation. In cold weather, the bees huddle tightly together; on warmer days, the cluster expands. Bees on the outside of the cluster form an insulating shell; bees in the center generate heat by shivering their flight muscles. Eating honey, a high-energy food, the bees can generate 104 degrees in their flight muscles. The queen remains inside the warm cluster. As bees on the outside chill, they rotate to the center of the cluster. To conserve food, drones were expelled from the hive with the first frost. Today’s photo shows an American bison in Wyoming. 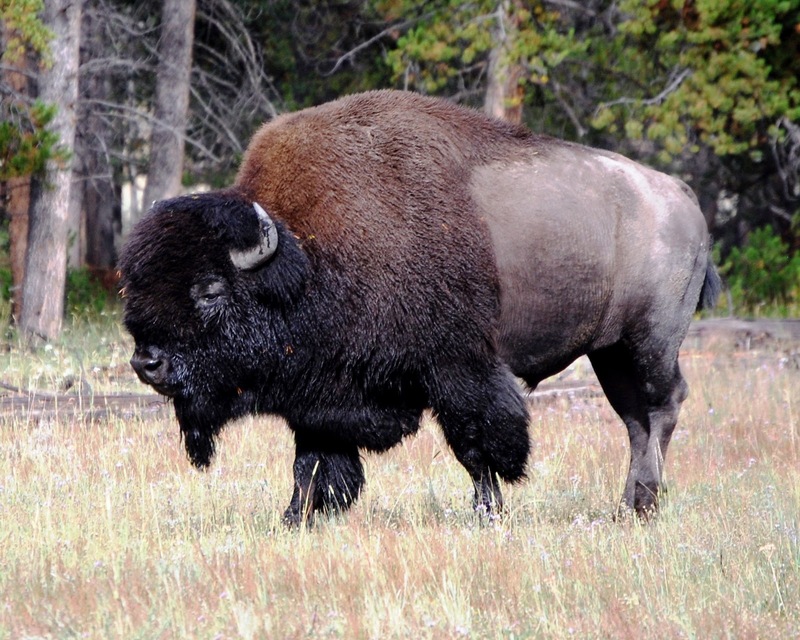 These great creatures survive extremely cold winters insulated by a hairy body. Bee yards often attract a number of animal visitors, both domestic and wild. Some of these animals are pests, some are an annoyance to the beekeeper, and some are beneficial to the bee hive. 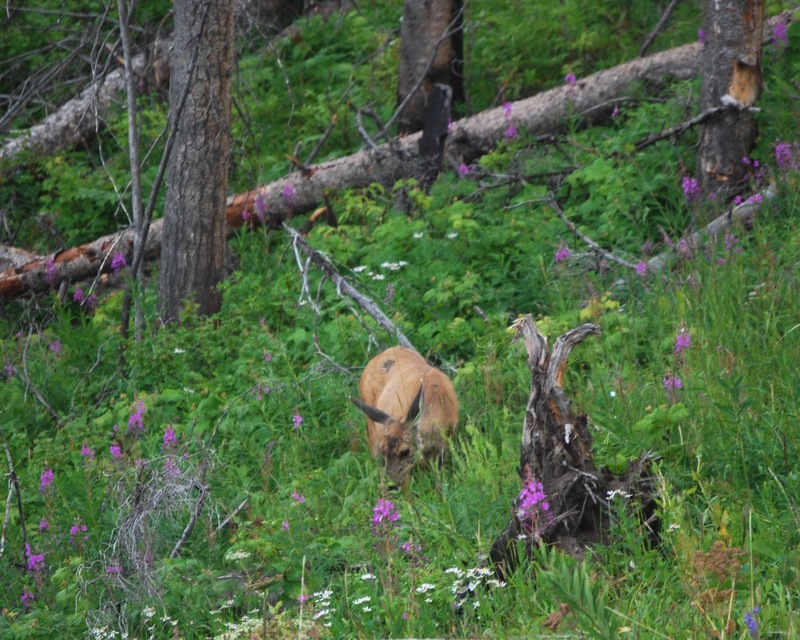 Where bears exist, they seriously damage hives. Here, beekeepers take preventative actions, like using electric fences around the hives. Fortunately, bears are quite rare around our bee yards. Skunks are probably our most serious animal pest of bee hives. These small nocturnal mammals enjoy eating honey bees. They scratch at the hive entrance with their claws to draw out the guard bees. The skunks catch and eat the bees, leaving evidence of their presence: egg-shaped pellets of bee exoskeletons. Skunks will remain at the hive entrance for long periods of time catching and eating bees. The continuous scratching disturbs the hive, making the bees quite defensive. Often our first indication of skunks in the area comes from guard bees greeting us with a sting as soon as we approach the bee yard. 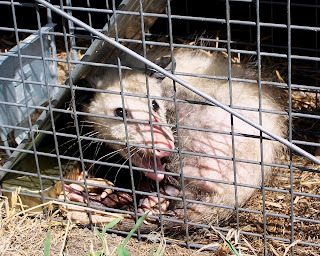 Possums and raccoons at times become bee hive nuisances. Whenever any of these small critters start attacking hives, I set a live trap and remove the animal. In today’s photo, a possum, North America’s only marsupial, snarls from inside the live trap. It will be carried miles away and released unharmed in the woods. If bee hives are located in pastures, we need to fence around the hives if livestock is present. Horses and cattle may brush up against exposed hives. Some birds eat honey bees. Eastern kingbirds like them; purple martins and mockingbirds eat a few. Sparrows, domestic chickens, and guinea fowl forage along the ground around bee hives. Eating small insects, they are probably beneficial to the hives. Bats help control wax moths; owls, cats, snakes, and coyotes help control mice and rat populations around bee yards. I regularly find tree frogs inside bee hives. I don’t think that they do any damage. Guard bees effectively protect hives from most intruders. There are traditions that have been passed down among beekeepers for hundreds of years. For example, it is still common to hear of folks beating on pots and pans to settle a swarm of bees. Another ancient tradition involved notifying the honey bees that there had been a death in the beekeeper’s family. The bees were notified by moving the bee hives an inch. Today, I moved some of my hives an inch. My father, Luther Underhill, died at age 92. Luther came to live with Rita and me on Peace Farm after my mother’s death. They were married for 69 years. He loved the domestic birds on the farm and the bird sanctuary. Luther was always ready to follow along with me to the bee yards, and he loved to go to the beekeeper’s wood shop where we assemble, paint, and repair bee hives. This year’s honey crop was produced on frames that Luther helped paint with chemical-free beeswax that we collect from our honey harvests. In today’s photo, Luther holds a freshly-coated frame. Collecting and saving our own beeswax cappings is part of our integrated pest management plan. The honey bee’s nest is built of beeswax honeycomb; and beeswax acts like a sponge, absorbing many chemicals in the environment. Since we do not use miticides or harsh chemicals in the hive, our cappings beeswax is relatively free of chemical pesticide contaminates. We paint this beeswax onto frames of plastic foundation. The wax makes the plastic much more attractive to the bees. 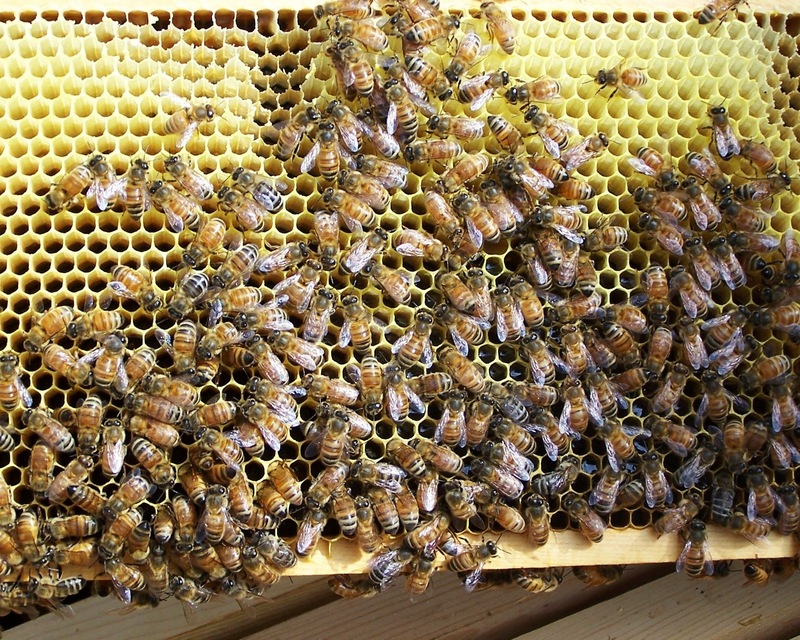 As the bees start to work on the frames, they begin by shaping the added beeswax into cells. Having a supply of chemical-free beeswax allows us to more aggressively cull old frames. The rigid plastic foundation can be easily reused. 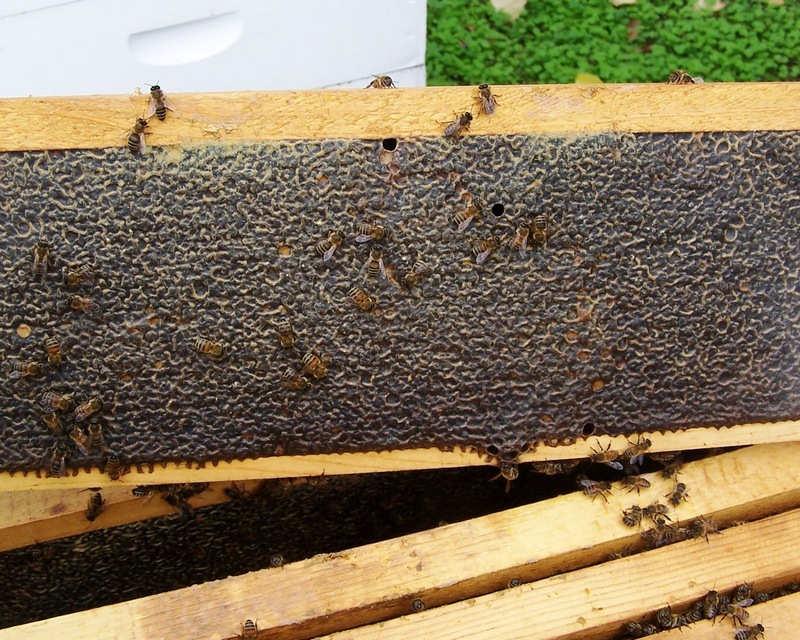 Removing the comb from old, dark frames effectively removes chemicals and disease spores from the hives. It helps fight reproductive spore-forming American foulbrood, chalkbrood, and Nosema disease. The bees have been notified; Luther will be remembered. News stories, particularly related to Colony Collapse Disorder, over the past four years have brought considerable interest in beekeeping. I am regularly approached by individuals who are interested in getting started keeping honey bees. They have questions about obtaining bees and ordering or building bee hives. I always encourage them to join their local beekeeping association and follow along with experienced beekeepers as they learn about honey bee biology and the craft of managing bees in hives. When Reverend L. L. Langstroth built the modern bee hive in 1851, he used the available lumber of the day. His hive box stood roughly nine inches tall. That same box is still in wide use today, and is commonly called a “deep” hive body. A typical bee hive uses two nine-inch hive bodies and has a volume of 84 liters. Honey is collected in supers of five or six inch heights. At Peace Bee Farm, we prefer to use a slightly different arrangement. We use three medium-depth boxes, often called “Illinois” hive bodies. With a depth of roughly six inches, the three medium boxes make a hive having the same 84 liter volume. Why would one use three boxes with 30 frames instead of two boxes with 20 frames? The medium-depth boxes provide many advantages. First, it is a convenience to the beekeeper to manage equipment of the same size. I find the greatest advantage of using the same size frames for hive bodies and honey supers in swarm suppression. Swarming is often initiated by brood nest crowding. Brood nest frames full of spring-time honey can be moved up into a super to immediately relieve brood nest crowding. The transition from deep to medium equipment can be accomplished over the winter by allowing the bees to move upward into frames of drawn comb filled with honey. Once the queen is up in the medium boxes, I place a queen excluder under them to prevent her from returning to the deep box. Whenever we are planting, we should give consideration to the honey bees and the native pollinators. Whether we are planting a flower garden, a kitchen vegetable garden, an herb garden, or a pollinator pasture, we can greatly increase the available forage and habitat for our important pollinators. By including native plants in our horticultural plantings, we can provide food as well as places for the pollinators to nest and reproduce. As Tod and I went about hand-planting a portion of our wetland reforestation project that was accidentally destroyed by a farmer’s plow, we tried to accommodate the pollinators as we replanted the forest. In the river bottoms, we planted hardwood trees from seed collected in other woods on the farm. We planted Shumard, Nuttall, overcup, pin, sawtooth, water, cherrybark, and willow oaks; shagbark and bitternut hickories; pecans; and American black walnuts. The seeds, acorns or nuts, we planted into the heavy clay Delta soil before rains. We also dispersed the seed pods of green ash to be carried by the wind. Along a gentle ridge rising above the river bottoms, the natural embankment of an old Mississippi River oxbow chute, we planted a number of species of trees less tolerant of seasonal flooding. For these plantings we included a number of flowering trees to provide food for honey bees and native pollinators. Along with the oaks, hickories, pecans, walnuts, and ash, we planted seed for black locust, peach, plum, and persimmon. Along the ridge, we also distributed by the wind the seed of catalpa and redbud. After the tree seeds germinate and start growing, we will return and plant understory plants like hawthorn, blackberry, and milkweed. Grape vines and native muscadine vines will provide food for honey bees in the treetops. After pollination, their fruit and seed will provide food for songbirds and small mammals that will distribute the plants throughout the forest. Clouds gather for the rain that will start the regrowth of the forest. The New York Times published a story relating the rapid increase in the number of individuals who are choosing to keep honey bees at their homes in the cities. While beekeepers have always been welcomed in some cities, other communities passed ordinances to limit or prohibit beekeeping. 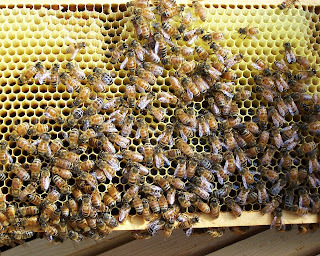 The story, which tells of beekeepers’ efforts to change restrictive laws, is located at http://www.nytimes.com/2010/12/09/garden/09Bees.html?_r=1&src=me&ref=homepage. Some of those communities that attempted to restrict beekeeping did so in an effort to prevent Africanized honey bees from entering. Laws limiting beekeeping activities may actually have the opposite effect. Fortunately, the Africanized honey bees have not proven to be the threat that some predicted. All beekeeping organizations recommend beekeepers adopt good neighbor policies involving beekeeping practices designed to lessen unpleasant encounters between honey bees and the public: Bee hives should not be placed close to property lines. Tall fences or shrubs encourage the bees to fly high above the heads of neighbors. Hives placed in pastures with livestock need to be fenced to keep animals away from the hives. Beekeepers should provide the bees a source of water. Don’t place too many hives in residential areas, usually three or four for lots less than one acre. Bees should be worked in a manner to prevent disturbing bees when neighbors are present: Open the hives in the daytime when bees are foraging. If a colony is defensive, re-queen it. Reduce robbing by not working bees during a dearth, and limit the time that honey is exposed to flying bees. Having managed honey bee colonies benefits cities: They provide pollination for food and ornamental plants, establish a trained group of beekeepers who can handle bee emergencies, and prevent the creation of environmental niches for more dangerous stinging insects. I think that maybe the greatest benefit involves developing environmentally aware citizens. Peace Bee Farm maintains three bee yards in public areas in the city of Memphis. Today’s photo shows some of our urban bee hives facing an evergreen barrier. The survival of a honey bee colony over the winter depends largely upon the way the beekeeper sets up the hive in the fall. The first requirement for winter-time survival is that the bee hive must have adequate ventilation. Honey bees maintain a warm hive throughout the winter. Whenever the bees have brood present, they maintain a temperature in the brood nest of 95 degrees Fahrenheit. The bees can withstand a cooler temperature than their developing brood, so they will only warm their cluster of bees to about 70 degrees when they stop rearing brood in the winter. This is equivalent to our lowering the setting on our home thermostat in the winter to save energy. The honey bees’ respiration produces moisture inside the hive. With a warm, damp atmosphere inside the hive and cold winter temperatures outside, condensation occurs inside the hive. 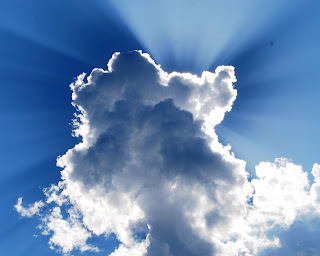 The effect is similar to that which occurs on the outside of a cold glass of iced tea on a humid summer’s day here in the Delta. Water drips profusely down the glass. Water from condensation dripping into the brood nest bees kills bees. Tilting the hive forward in the winter keeps the water from falling onto the bees. It is most important to provide ventilation to prevent condensation from occurring. Leaving screened bottom boards uncovered provides good ventilation for the hive. A vent port in the hive’s inner cover provides air flow through the top of the hive. 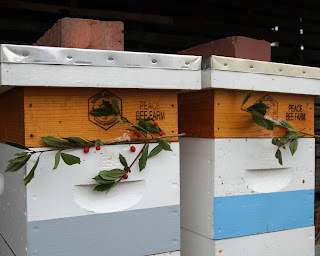 Surprisingly, protecting from cold temperatures is not a requirement for winter-time hive set-up. The second requirement for the bees to survive the winter is that they must have adequate stores of honey, and it must be located where the bees can access it. The honey should be above the cluster of bees. The bees consume the honey above their cluster and then move upward into the empty cells. Experience tells beekeepers how much honey the hive needs for the winter: in the Arkansas Delta, about 60 pounds. One colony of honey bees stood out as different from each of the others. When I checked the hives for stored honey for the winter, all were heavy in weight with the exception of one. Most hives were full of honey, located in the top of the hive, available for the bees to access during cold weather. However, one hive was extremely light in weight. Inside, I found yellow-colored bees as opposed to the dark-colored bees that occupied each of the other hives. Click on the photo and you can see the chewed-out honeycomb and empty cells where the stored honey has been removed. No, the hive has not been robbed; these bees simply consumed more stored honey than their neighbors. The difference between this hive and the others is the race of bees. The dark bees are Russian; the yellow bees are Italian. Each race of bees has distinct behaviors. Russian honey bees tend to build up their population slowly in the spring. It was already mid-spring when I added the colony with the young Italian queen to this bee yard. Italian honey bees build up quickly in the spring and maintain a large population throughout the year. Both races of honey bees in this bee yard produced good crops of honey, allowing me to harvest some surplus honey from each hive. It was after the harvest that the difference in the races of bees became apparent. The Italian bees with a larger population simply consumed their winter stores early in the fall. Fortunately, I detected the hive’s honey shortage in time to add supplemental feeding. The Russian bees, popular because of their resistance to Varroa mites, over-winter with a smaller cluster of bees and require less stored food for the winter. Russian, Italian, and Carniolan queen bees are each selected for resistance to parasitic mites. It is easier for the beekeeper to manage bees with more similar behaviors than the two races occupying this bee yard. Four years into the largest die-off of honey bees that has been recorded, we are finding how resilient the honey bees and the people who tend to them are. One of our followers sent me at link to a presentation recorded in the summer of 2008 by one of the researchers working to uncover the causes of honey bee Colony Collapse Disorder. Though some time has passed since the recording was made, the conditions, driven by pesticides, toxins, and disease, described in 2008 remain accurate today. Dennis VanEnglesdorp, acting as the State Apiarist for Pennsylvania’s Department of Agriculture as well as conducting research at Penn State University, passionately describes the condition of beekeeping in America. Bees serve us in a most important way: We rely upon the honey bee to provide one bite out of every three that we eat. This is accomplished by honey bees completing the reproductive step of pollination of our flowering crops. The bees that do this work are carried about the country on trucks by a group of crafty, determined migratory beekeepers. 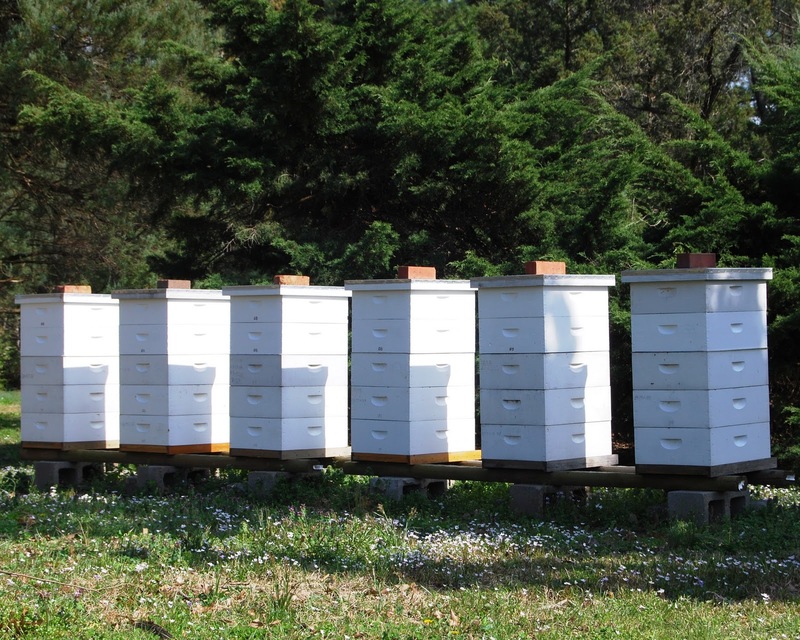 In spite of heavy losses, they have been able to maintain colony counts by splitting hives each year. VanEnglesdorp asks why bees are now suddenly susceptible to the conditions that result in CCD. He mentions the heavy dependence our agriculture places upon pesticides. Studies are being conducted to identify the pesticides found inside bee hives. Interestingly, some of the hives with the greatest amount of pesticide are healthy. Some beekeepers attribute this to the deadly result of having too many parasitic mites in a hive. Possibly, those beekeepers who used pesticides heavily in the hive more effectively controlled the Varroa mites and the viruses that they vector. VanEnglesdorp describes our environment as suffering from “Nature Deficit Disorder.” To help correct this situation, he suggests we “make meadows, not lawns.” I photographed a mule deer eating fireweed, a famous honey source, in a Wyoming meadow. Hear VanEnglesdorp’s enthusiastic 16-minute presentation at www.ted.com/talks/lang/eng/dennis_vanengelsdorp_a_plea_for_bees.html. 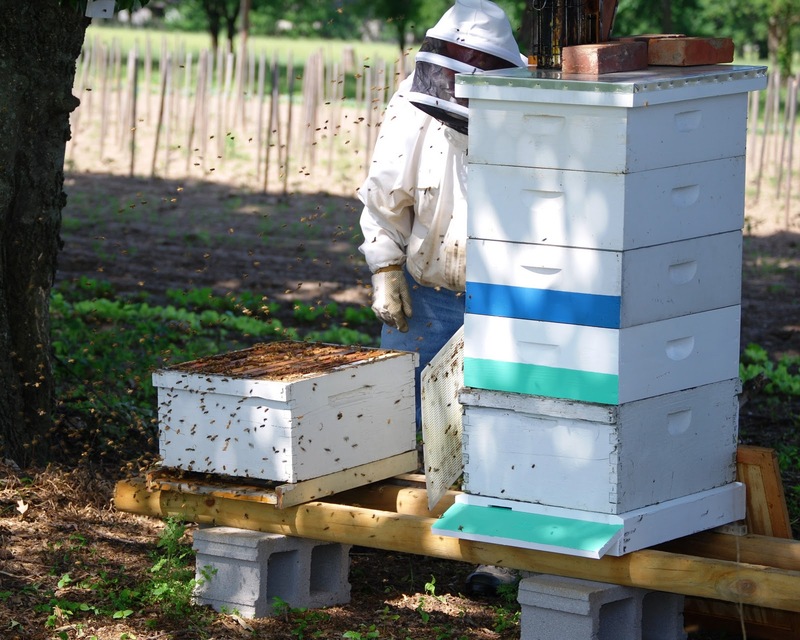 The Northeast Arkansas Beekeepers Association’s membership includes a diverse group of commercial, sideline, and hobbyist beekeepers who willingly share their experience in handling bees. The group’s conversation usually revolves around honey bee health. Meeting in Jonesboro, the discussion involved the things that kill bee hives. We talked about Varroa and tracheal mites, Nosema disease, viruses, American foulbrood, Colony Collapse Disorder, and the several other pests and pathogens that affect honey bees. Fires are a cause of concern, especially for bee yards placed in agricultural areas where fields are burned, sometimes by accident but usually as part of no-till farming practices. Windstorms damage bee yards, particularly here in “tornado alley.” Several beekeepers lost hives in spring-time flooding. Delta beekeepers who occasionally experience some water in the bottom of their hives literally lost hives; they washed away. There is universal agreement as to the number one cause of honey bee colony losses: starvation. Depending upon seasonal flowers for food, a honey bee colony spends most of the year in preparation for the dearth of flowers in the winter. The honey bee is unique as the only insect in the temperate region that stores food so that it may remain alive and active throughout the year. The amount of honey that the colony stores is determined by the size of the colony, the forage available, and the weather conditions. Whether the colony has enough stored honey to survive the winter often depends upon how much honey the beekeeper harvests from the hive. 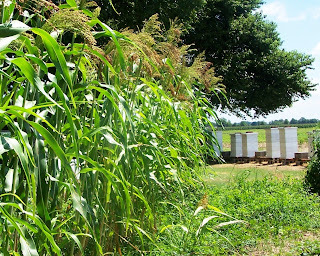 Experienced beekeepers, like those of Northeast Arkansas share their experience in how much honey a colony needs to survive a cold Delta winter. The pictured hive has plenty of honey for the winter. Worker bees have concentrated honey in the upper portion of the hive, the appropriate place for the bees to access the honey. Hives that are light in weight need supplemental feeding. I lift the back of each bee hive and try to estimate its stored honey. EAS Certified Master Beekeeper and Owner of Peace Bee Farm of Conway, Arkansas. Former President of Arkansas Beekeepers Association, Tennessee Beekeepers Association, and Memphis Area Beekeepers Association. Recipient of the President's Volunteer Service Award. All content Copyright 2009-2019 by Richard Underhill and Peace Bee Farm.